In Part 1 of our series, Bob insists to his financial advisor, Helen, that he be part of the Facebook IPO. In Part 2 of our series (above) his position is down nearly 50%, but is he discouraged? Not in the least! We have all fallen in love with stocks. The dopamine starts to flow, the attachment forms, and we experience a sense of euphoria picturing the windfall we see in our near future. Bob has yet to learn this. And he has a lot of company, unfortunately. And if you are interested in our trainings or our book, please contact us or visit www.marketpsych.com for more. ~ Benjamin Graham, Jason Zweig in The Intelligent Investor, Rev. Ed. As a psychiatrist I’ve born witness to many extremes of mood. I’ve tried to steer manic venture capitalists away from spending their life savings on cocaine and sports cars. And on the other extreme I’ve born witness to the deep pessimism and despair of suicidal clients, trying to help them choose life over oblivion. My efforts are not always successful, and I've learned a lot about the limits of rationality when faced with extremes of mania and despair. At both extremes many of the people I’ve worked with are highly intelligent and believe they are acting with perfect rationality. Yet despite their innate intelligence, deeper emotions occasionally sweep away their anchor to reality. Today’s letter will examine the nature of optimism in the financial markets: How we experience it, how it distorts our investing, how it plays out in markets, and how we can succeed while being both optimistic AND realistic. As we go through these themes, we will look at French and Dutch optimism in the Euro-zone, the delusional optimism at the launch of the Facebook IPO, how portfolio managers can use optimism to their advantage, and visit some tools and techniques for making ourselves better investors. We’re excited to announce a partnership with Thomson Reuters as exclusive provider of our quantitative sentiment data! You can see our first joint product brochure here. The many press mentions of this event are in the right column. Now that our data business is launched, we are seeking angel investments into the business in exchange for equity and partnership dividends. We’re excited about what we’ve accomplished – we’ve built the most comprehensive and detailed sentiment engine in the world, formalized a partnership with Thomson Reuters, and have many additional products on the way. Please respond to this email (richard@marketpsychdata.com) for more information about the company and this investment opportunity. This summer we've spoken in London, Las Vegas and Quebec and we’re speaking at several events in New York City and again in London next month (congrats to our British friends for a terrific Olympics!). I’m personally settling into Westport, CT this month, which is even more beautiful and relaxing than I had anticipated. 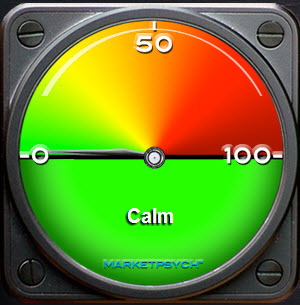 We are launching additional features on marketpsychdata.com. Please let us know about your specific data and graphics interests, and we will see if we can accommodate. (We’ve already heard a request for backtested results on our top ten lists, which is in development). Frank Murtha on Nightly Business Report. August 7, 2012. Before we jump into the toxic effects of blind optimism, consider that optimism is generally a fantastic thing. Epidemiological studies show that optimism has significant benefits for individual physical health: reduced cardiovascular disease and cancer rates. Optimism also correlates with financial success. And of course, optimism feels good. So on balance, optimism is a great thing for us as individuals. At the end of the newsletter we lay out two simple techniques for boosting optimism in your daily life. Yet extreme optimism - manic optimism - is a BAD thing. Mania is an extreme of optimism, and it is no surprise that extreme bull markets are called manias. The diagnosis of a mania in the markets is defined by analysis of value deviating from fundamental reality. In this sense manic optimism is characterized by delusion. Putting manic optimism aside, there are also deleterious effects of everyday optimism on our thought processes, which psychologists call the optimism bias. 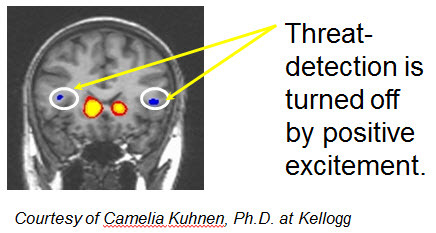 The optimism bias is defined by “dangerous risk taking, poor analysis, frivolous spending, and wealth destruction in tangential pursuits and poorly thought-out strategems.” I’ll reprint an image from a previous newsletter which shows how the brain deactivates threat detection areas when an investor becomes excited by an opportunity. This deactivation (blue) leads to the above symptoms of optimism bias. Don Quixhote might be the poster-child for the optimism bias and the rigidity, poor analysis, and flights of fancy stubborn optimism can provoke. Ben Graham indicates that optimistic investors are the ones to sell to, implying that prices are about to drop for those optimistic investors. Graham was correct that optimism was a sign of ultimate decline in developed markets. But for under-developed markets, optimism can be only the beginning of a long bull-run. In emerging markets optimism can fuel a long mean reversion of undervaluation to fair valuation (see Burma for example, where optimism has only recent spiked after decades of extreme pessimism). So where around the world are investors optimistic right now? France is a country I love. The people, art, culture, lifestyle, food of France – there is so much LIFE in France. And so it pains me to write today about the folly of French optimism. In the Thomson Reuters MarketPsych Indices we’ve been seeing a high level of optimism in social media about France in the first half of 2012, especially following the election of Hollande. See this comparison chart of all nations below for the first half of 2012. From the social media in May 2012, we see Greece, Iran, Sudan, and Syria show the most economic pessimism with their light green colors. Economic optimism is highest in the darkest green countries: Peru, Uruguay, Canada, Scandinavia and the Baltics, Kazakhstan, Mongolia, and Ghana. White countries were excluded due to typically low data quantity. Using our TRMI indices, we can display the newsflow on this map in real-time, and we will be doing so in a few months. The problem with this chart is that France has greater optimism than Germany. This will lead to tension in the German-French relationship. Interestingly, we see the opposite dynamic in the news – the economic news shows greater pessimism about France than Germany and is a better reflection of reality. The fundamental reality (reflected in economic news) is bearish on France, but the French population is relatively bullish – the shoe has yet to drop. Many other countries are more optimistic than France, but France has difficult choices to make soon. Without an appreciation of the danger, those choices may be put off longer, leading to a greater chance of a Euro-zone break-up later. Based on the numbers, France’s budget deficit and weak economy are one of the greatest risks to the Euro-zone. Another significant optimism risk to the Euro-zone is the Netherlands. With such high optimism, voters in the Netherlands are feeling downright cocky – “let the lazy Southern Europeans leave [the euro-zone]” is a common refrain I’ve heard from Dutch friends of mine. (This is in contrast to Germans, from whom I’ve heard much more concern with helping the debtor states work their way out of their debt). In France Hollande’s top proposed tax rate of 75% is not a significant remedy for the French budget deficit. However Hollande’s proposed tax hike is a negative hit on business sentiment. A rise in the top tax rate from 41% to 75% creates a sudden sense of unwelcome for the wealthy and disincentivizes entrepreneurs, regardless of largely symbolic nature. For Hollande to achieve the political cover he needs for impending social services budget cuts, he should have taken a cue from Warren Buffett. As Buffett knows, the better psychological strategy for increasing taxation is an increase in the estate tax (currently maximized at 40% in France). Taxing the wealthy at their death both appeals to the public sense of fairness (redistribution of wealth away from their presumably less productive children) and does not disincentivize the production of wealth during their lifetimes – both of which are public benefits. The Maginot line was built at great expense based on an idea about defense. But the defenses were only as strong as their weakest section. Once one section was punctured, the line became useless. The French welfare state is based on a humane idea. Its weakest link is that current benefits have been paid from the future. The welfare state does not pay for itself, and as a result it has become a pyramid scheme. Given that U.S. optimism is near the level of France’s, we are likely to have our own problems making difficult choices in the months and years to come. Before the U.S. election I will write about the fundamental split in vision between American economic conservatives and economic liberals, hinging on how optimism is framed in the political discourse. As the lazy days of summer pass, we’re seeing the risk of a dangerous Euro-zone collapse build. And given the optimism of France and the Netherlands – an optimism that might prevent leaders and the public from taking necessary but painful steps – we project that the risk of an ultimate fracture from within the Euro-zone will come from a rift between dour Germany and optimistic France, likely kindled by a Dutch election that thumbs its nose at Euro-unity. Our Bubbleometer is comprised of approximately 12 variables that have been found to predict the S&P500 returns one-month out, based on social media conversation. The factors include overall optimism versus pessimism balanced by actual fundamental strength. Emotional optimism is a contrary indicator, but fundamental strength is a positive indicator. 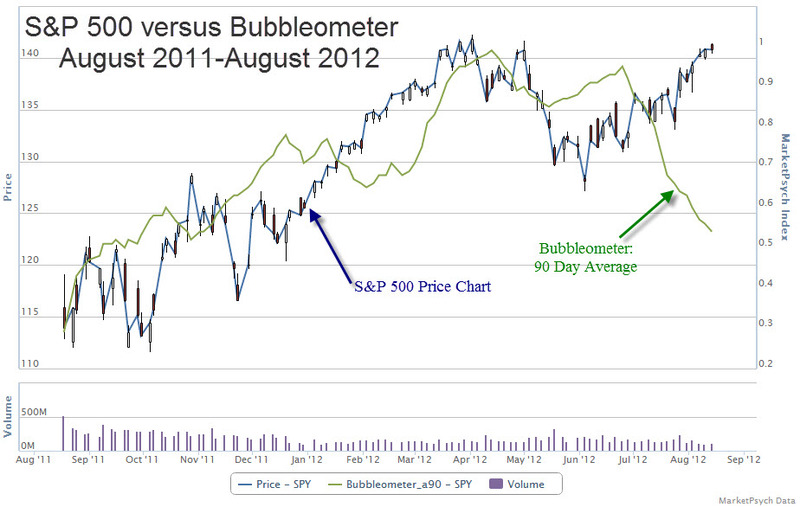 Our Bubbleometer has fallen to relatively moderate levels for the S&P500, even as the rally has progressed off its low. This indicates to us that the current rally is sustainable into the Fall. We’re likely to see a higher market by year-end, despite (or perhaps because of) the gray clouds hanging over Europe. It has been a sport in the media to criticize the Facebook IPO. But if you’re a long-term investor you might appreciate that not every stock goes up. The IPO went reasonably well given its huge dollar size, massive trading volumes, and the usual banker conflicts-of-interest. What is most concerning to me is why anyone wanted to buy into the IPO, much less overvalued Facebook stock, especially after the shares were sold publicly. Apparently the marketers did their job well, and much of the uninformed investing public took a gamble. While most Facebook IPO investors had a “rationale” based on some sort of personal logic for their investment, we offer the following – the brain will make up a good rationale to justify us doing what we really feel inclined to do for EMOTIONAL reasons (i.e., Graham’s optimism). Who bought Facebook shares? Probably those who were excited, optimistic, and caught up in the hype. Trouble was, there were a lot of those people (MorganStanley didn’t get so big by products alone – marketing is key). Dr. Murtha created a humorous follow-up video to his popular first-take on the Facebook IPO. Part 1 showed what financial advisors are up against when talking to optimistic (and under-informed) clients. Part 2 demonstrates the mind-bending effects of what we call “toxic optimism” or what the layman might call “sheer AWESOMENESS” as a client ponders Facebook stock. Please take a look at Part 2 and let us know what you think. Given that Graham’s book has been available since the 1950’s, and he has many wealthy disciples such as Warren Buffett, we all know what to DO to make money investing – Buy low, sell high. Buy cheap, sell dear. Buy from pessimists, sell to optimists. Researchers have found that optimistic investors make a characteristic mistake - they act as if good times will last forever. In a 2009 study, Sentiment and Momentum, co-authors Doukas, Antoniou, and Subramanyam found that small investors hold onto losing positions too long during optimistic phases in the stock market: “An analysis of net order flows from small and large trades indicates that small (but not large) investors are slow to sell losers during optimistic periods.” The researchers also found that during bull markets investors betting on the current trends continuing suffer losses: “Momentum-based hedge portfolios formed during optimistic periods experience long-run reversals.” These findings bolster the evidence for the “Confirmation Bias” – the tendency of optimistic people to believe information that supports their sunny outlook and discount information that contradicts it. On the one hand, what are we to do if a country or investment has been optimistic for years (e.g., 2003-2007) and then a shock occurs that causes a brief dip on fear (e.g., the credit freeze of August 2007)? In such situations, you don’t want to immediately buy on pessimism. Turning the Titanic of public opinion takes time. Best to watch from the lifeboat. On the other hand, as we emerge from the financial crisis, the brief periods of investor optimism (e.g., the spring rallies of 2011 and 2012) have been quickly followed by selloffs fueled by talk of imminent European financial apocalypse. In those instances, we DO want to buy from pessimists. The above study implies that Graham was correct, the emotional component adds value to understanding fundamental valuations. 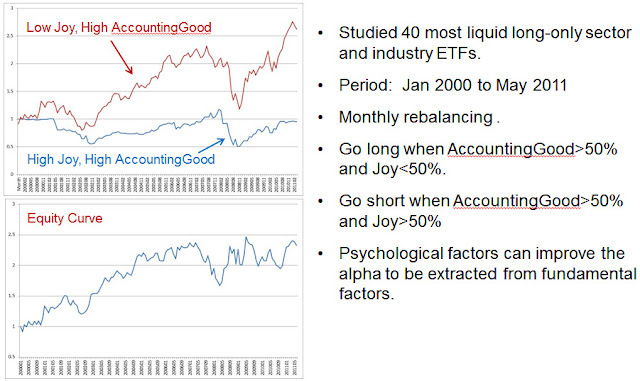 Value strategies can be improved by adding psychological data on optimism and pessimism. We seem the same delayed effect in places such as Burma. There are more horse-carts than cars in Burma. There are loads of natural resources. There is huge potential for growth there, so no wonder investors are optimistic. And they should be. Over the long term the country will likely do very well and buying optimism may be short-term painful, but long-term rewarding in a place like Burma. The human problem with investing is that our perspective changes in reaction to the markets. Our moods shift as prices shift. Our time horizon lengthens or contracts based on our blood levels of stress hormones. Monday the markets are up and we are analytical long-term investors. On Tuesday Greece defaults, the S&P500 dives 7%, and we become traders. We’ve tested over 20,000 people in our free online personality tests since 2004. We’ve found some key indicators of overconfidence that correlate with lower reported investment and trading returns. Please take a personality test if you haven’t already before reading these results. People who are more Extroverted (outgoing, gregarious, and optimistic) are more likely to have lower overall investment and trading returns. This result is true in all three of our personality tests – businesspeople, investors, and traders – all report lower long-term returns in their line of business if they are extraverted. In one study extroverts were more likely to gravitate towards short-term investing, thus increasing their risk of loss. The last question on our personality tests asks: Comparing myself to other investors, I think my abilities place me: (users answer in ranges: “Among the top 5 percent”, “Among the top 10 percent”, etc…). We found that this question seems to speak to men’s pride, and women’s sense of humility. On average men rate themselves as better investors than women do. Yet men’s actual reported returns are significantly lower than those of women. This disconnect between men’s returns and self-perceptions is most significant in relation to risk. Men suffer significantly greater lifetime drawdowns than women. Men have more trouble resisting the temptation of a “sure thing.” Yet sometimes men actually find a sure thing. In those cases, men are more likely to sell out too soon – they have a shorter attention span when it comes to investing, perhaps because they take too much risk due to testosterone effects on risk-taking, and they are more easily shaken out by volatility. Short of taking a personality test, how do we know if our own optimism is excessive? - Overoptimistic people do not look for contrary facts, due to the point above. - Overoptimistic people have no plan. What if volatility increases? What if the price drops 2% tomorrow? No contingencies are considered (again, see point 1 above). - Use a system that requires you to check the potential downsides. Force yourself to look at objectively contrary information. - Use only objective criteria that are relevant. “Facebook is the third largest country in the world.” Is an interesting “fact”, but it is not relevant (nor is it accurate, obviously). To remain analytical, consider facts such as, Facebook has 955m users. Then figure the revenue from each. Then look at the growth rate of revenue. Those are facts. How many users does Facebook need to have, at the same servicing cost, for its P/E ratio to be 15 (that of Apple)? About 5 billion? How many people live on earth, again? Hmmm…. When I was a kid, we used to set off fireworks rockets all June up to the U.S. Fourth of July independence celebration. One of our favorite games as kids was organizing “armies” and shooting rockets at each other in the midst of large cotton fields. Naturally, this was a very dangerous game, and we’re lucky we never had serious injuries. You could say that we were over-optimistic that we wouldn’t be burned. That said, there are few things that get the blood pumping like dodging a flaming rocket. Part of the thrill was the sheer unpredictability of the rockets’ trajectory. Because in fact, launching a primitive rocket towards the opposing “army” often had unintended consequences. Sometimes the rockets we launched boomeranged. They turned in the sky in a beautiful fiery arc and headed straight back into our group before exploding, sending everyone diving for cover. To be clear, I think war is almost always a bad idea (threat of war no, actual war yes). Now Israel is banging the drums of war with Iran again as we suggested they would in our February newsletter. With Syria and Hezbollah preoccupied with keeping Assad in power, and Saudi and Egypt silent supporters, Netanyahu appears to be feeling lucky. And he is about to fire his bottle rocket. It turns out that information flow can be predictive of war (thanks to David Ensor for the tip! ), especially in a case like Israel’s where public support is needed to undertake such a risky move. The Israeli government appears to be preparing its population for war, as described in this book (thanks to David Ensor for the tip!). In our studies we’ve already seen interesting correlations between social media sentiments and violence reported in the news the following week and month. We haven’t applied this to Israel yet, but we will in the next month. We will describe more about predicting social events and violence in subsequent newsletters. Oil prices will certainly spike when the Israeli attack on Iran occurs, but the spike is likely to be short-lived as it becomes clear that the strike is limited and Iran was bluffing about cutting off oil deliveries through the Strait of Hormuz. Yet despite the self-interests of both Iran and Israel in a limited engagement, there are a variety of paranoid and opportunistic actors in the region who may see a chance to gain advantage of their own. As I noted above, launching a bottle rocket in one direction doesn’t mean it won’t turn back on you in unexpected ways.